“We’re going to make sure Ford gets our message,” said Marco La Grotta of Fightback. 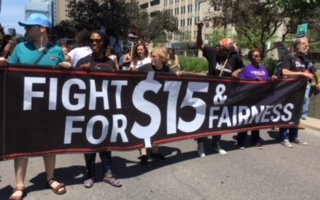 Fight for $15 and Fairness started planning the rally months before Ford’s election. 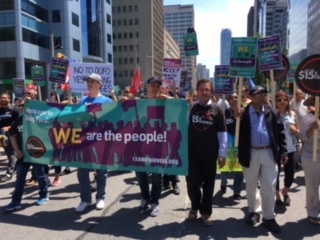 Rally speakers included well-known activists like Naomi Klein, author of No Is Not Enough: Resisting the New Shock Politics; Chris Buckley, President of the Ontario Federation of Labour; and Sandy Hudson, Black Lives Matter Toronto co-founder. 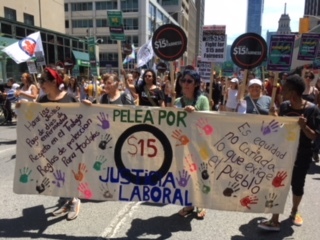 “Ontario’s labour movement wants to be sure one thing is clear to everyone: a $15 minimum wage is a better deal for workers than a tax cut,” said Ontario Federation of Labour President Chris Buckley. The rally was a high energy event. 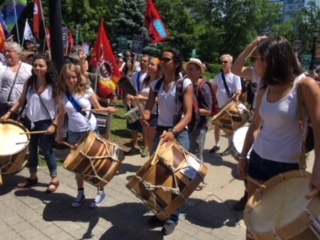 There were drummers and chanting—but most importantly, there were actions by individual activists. As the march headed up University Avenue to Queen’s Park, the massive flow of people stopped traffic going both ways. 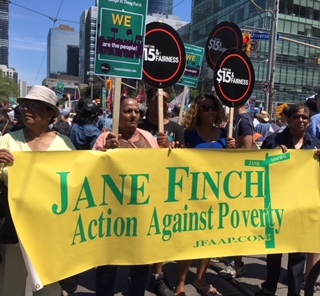 Activists were quick to take advantage of this opportunity to approach the stranded motorists and talk to them about the goals of the march and their concerns for Ontario’s future. Most drivers and passengers seemed willing to engage in these conversations, often asking questions and nodding in agreement. We asked protesters what they were planning to do to make sure Ford delivers on a decent work agenda. “We’re going to continue to mobilize, to fight him” said Marco La Grotta. When asked if he thought Ford would listen, Marco La Grotta was blunt. The Rally for Decent Work was one of the first major protests after the provincial election, but it’s definitely not going to be the last. 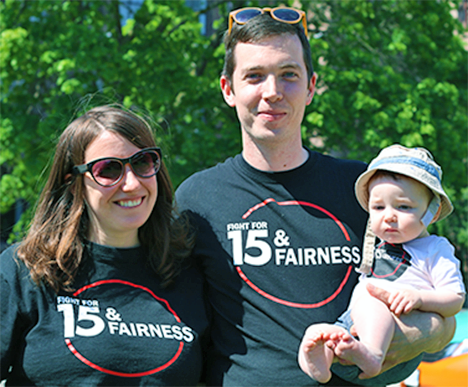 Fight for $15 and Fairness will be joining with other activists to make sure their message decent work message is kept front and centre. Graham’s organization, Toronto Disability Pride, will hold a march on September 22nd to promote the rights of individuals with disabilities and others who suffer from oppression and discrimination. Activists, unions, and everyday folks are mobilizing all over Ontario. If Ford doesn’t change course, they’re going to make sure that this is one long, hot, uncomfortable summer for him.